Canali has chosen Kolkata for its seventh boutique opening in India. Situated on the ground floor of the Quest Mall, one of India’s largest shopping centers, the new point of sale features the brand’s new architectural design concept inspired by the rationalist architecture of the 1930s and constructivist art. The space’s elegant, sophisticated style is expressed by precise linear shapes, warm materials and a fine eye for detail which further enhances the discreet luxury that permeates the setting. The new concept, launched this year, divides the boutique into themed spaces which are skillfully blended here with Indian culture to respect the traditions of the host country. Just inside the boutique entrance is the gallery area, defined by impressive free-standing crystal glass showcases, fine marble cladding and dark-coloured ceilings imprinted with the Canali brand pattern. This is joined by a more intimate room with a wooden ceiling and big, library-style, fabric and backlit glass decorative units. The back of the shop contains the cash desk, hidden behind a smoked glass partition, and the fitting rooms, which have a big video screen behind them on which images of the latest collections are projected. 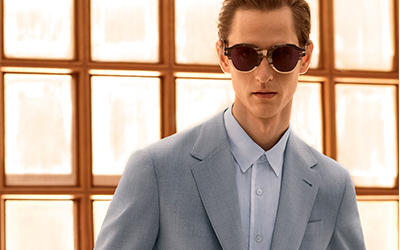 Canali confirms its commitment in India and strengthens the retail network.